Construction of fourteen rooms of which 10 will be classrooms, the remaining 4 to serve as library area, office and storage, toilet facility and kitchen. Oasis of Hope Christian School is located in the community of Nsumbi, on the outskirts of Kampala in the Wakiso District. 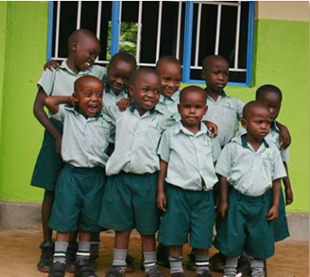 Oasis of Hope is an independent school with a Christian philosophy and curriculum and currently enrolls around 180 students in Nursery through Primary 7 from low-income families. The school started in 2015 using rented facilities. Recently the school board purchased a acre of land adjacent to the existing school. The current rented building is becoming too expensive for the school because the rent has increased significantly. Consequently, the school is in need of funds to build their own classrooms and has approached Classrooms for Africa for a grant to undertake the funding of the construction. An L-shaped building is proprosed which will house all the grade levels and provide other support facilities. Representatives from Classrooms for Africa have visited the school on two occasions and feel the curriculum is sound and there is good leadership.